The numbers may cause wonder, indeed hushed reverence seems innate to the very experience of one’s visit. Upon entering the gallery space, you are politely requested to remove your shoes—as well as any heavy coats, bags and bulky accoutrements which might inadvertently tangle the spidery threads of the installation. Still fresh in our memories, of course, is last year’s feline sabotage; here too, the delicate structure suffered at least one human assault before opening day. Nerves and numbers, however, are shed with shoes and coats; stepping barefoot down one level into the gallery space, as one’s eyes adjust to whiteness, fragile lines slowly emerge from the pale. The compulsion to look up for the delicate cobweb of threads is matched by the invitation to travel down the length of the space, as intimated by Ishigami’s installation. On display at the Barbican Centre’s Curve Gallery, Junya Ishigami returns to combining the structural language of architecture with nature. Junya Ishigami, Japanese Pavilion, 11th Venice Biennale of Architecture, 2008. Courtesy Gallery Koyanagi © Junya Ishigami, junya.ishigami+associates. – cloud, Toyota Municipal Museum of Art, 2010. Courtesy Gallery Koyanagi © Junya Ishigami, junya.ishigami+associates. Photo Yasushi Ichikawa.” data-emptytext=”Image” class=” cq-dd-image c-figure__img”/> Junya Ishigami, Another scale of architecture – cloud, Toyota Municipal Museum of Art, 2010. Courtesy Gallery Koyanagi © Junya Ishigami, junya.ishigami+associates. Photo Yasushi Ichikawa. 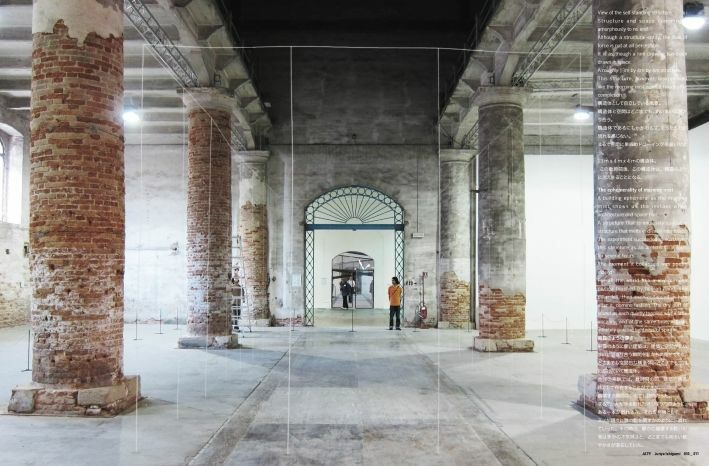 Ishigami’s installation in Venice combats themes of fragility and transparency at a time when the discipline of architecture finds itself at a point of financial and professional quandary. There is an inherent primitivism in defining a space through the marking out of architectural elements. The threads, or lines, almost vanish and leave users wondering where the installation not only is but where it was. It’s a ruin. Whilst a ruin, as a concept, holds a visual form, it also conveys its totality through the virtual. The ruin portrays a spatial organization through a collection of moments of decay. A temporality that is material but entirely inaccessible. The narrative of the ruin extends beyond the exhibition space.Ishigami’s Architecture as Air combats themes of fragility and transparency at a time when the discipline of architecture finds itself at a point of financial and professional quandary; it trembles amidst economic uncertainty while the role of the architect withers away. Transparency, as an architectural concept, has a lineage traceable to two main points of interest for this project. In 1942, Marcel Duchamp designed the Surrealist Exhibition “First papers of Surrealism”. He, too, filled an existing building with string, creating a barrier that intervened between the Surrealist artwork and space of exhibition. Duchamp used the string to consume the void space and disorient the user; the string was there to be seen. 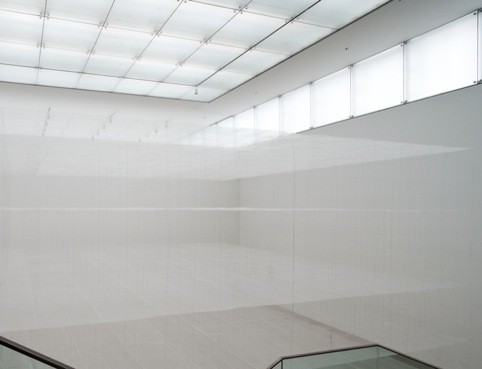 In contrast, Ishigami’s string, so lightly balanced, operates within the void of the building; not to contain the existing space, but to create a new space. This new space was so delicately constructed, however, as to not impact on the existing space; there were two spaces within the one space. Colin Rowe and Robert Slutzky, in Literal and Phenomenal Transparency , describe the use of the new word “transparency” its impact and misuse in the Modernist Architectural tradition. Here, large expanses of glass are used for the first time in a clear example of a newly-found transparency in architecture. It is not just the material that Rowe observes, but also the phenomenal – or the immaterial – that needs examination. 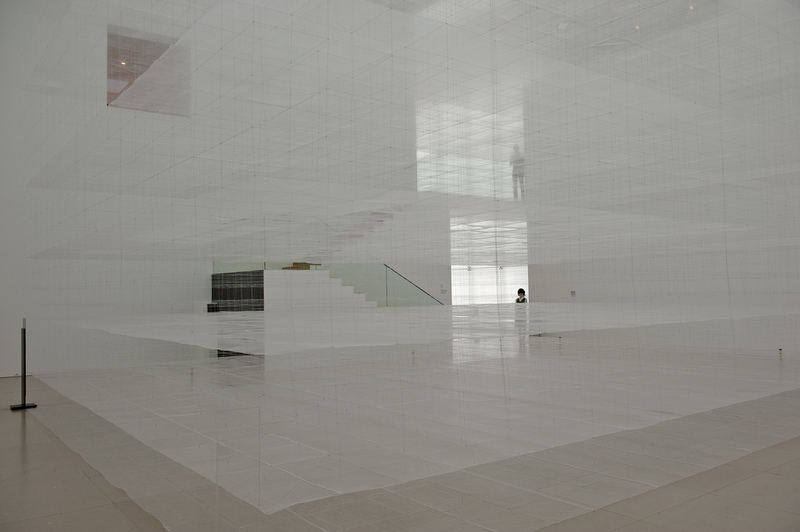 In Ishigami’s project it could be said there is a spatial and optical “misunderstanding”, whereby one space envelopes another. , The Curve, Barbican Art Gallery. installation photographs. Photo Lyndon Douglas. 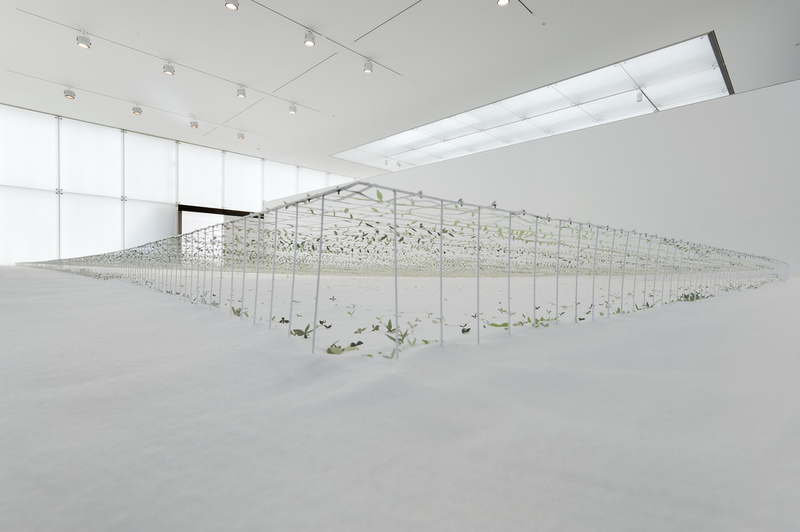 Courtesy Barbican Art Gallery, London.” data-emptytext=”Image” class=” cq-dd-image c-figure__img”/> Junya Ishigami, Architecture as Air , The Curve, Barbican Art Gallery. installation photographs. Photo Lyndon Douglas. Courtesy Barbican Art Gallery, London. 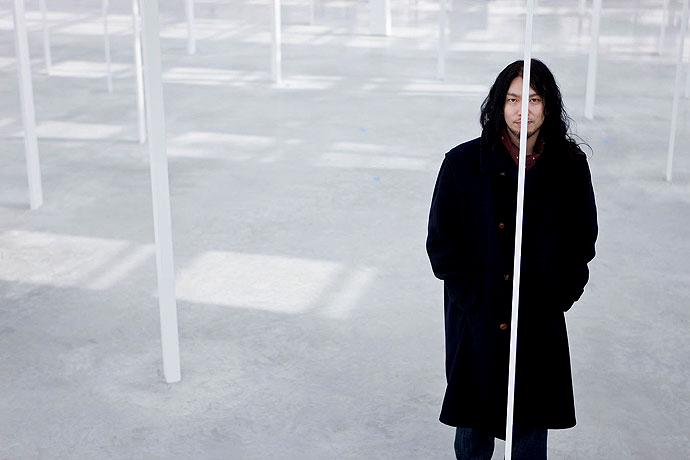 Ishigami is a practicing architect, concerned with structure and space; however, rather than the formal or even ecological implications of organic geometry, Ishigami meditates on the poetics of natural and physical structures. 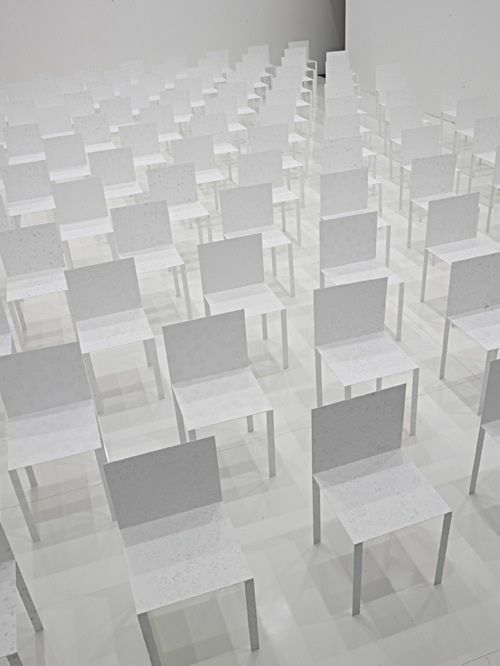 More of junya.ishigami+associates’ work is featured in Phaidon’s 10x10_3 and &fork. 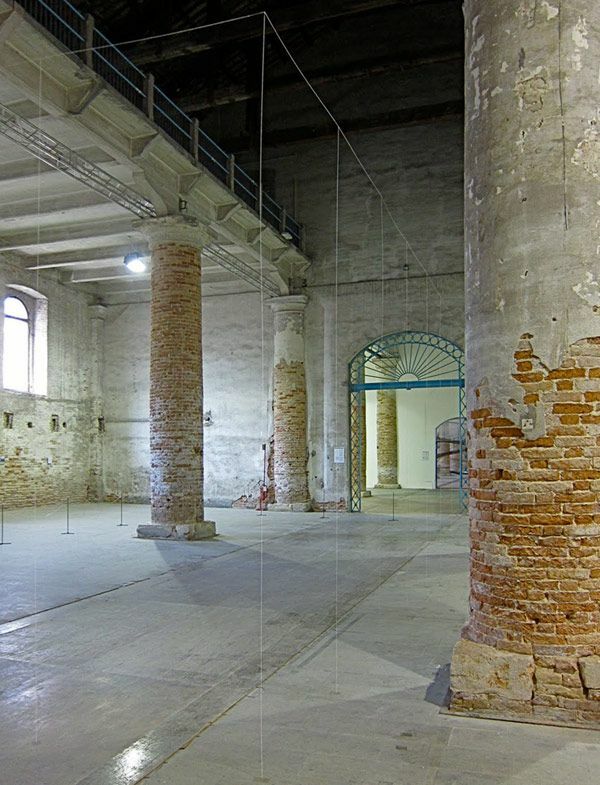 , 12th Venice Biennale of Architecture, 2010 © Junya Ishigami, junya.ishigami+associates. Photo Joseph Grima.” data-emptytext=”Image” class=” cq-dd-image c-figure__img”/> Junya Ishigami, Architecture as air: study for Château la Coste , 12th Venice Biennale of Architecture, 2010 © Junya Ishigami, junya. Architecture as Air not only creates a literal disappearance but a phenomenal confusion of spaces – a perfectly clear set of spaces, yet perfectly ambiguous at the same time.Architecture has long since been associated with mathematics and the art of geometry. Ishigami challenges the understanding of what constitutes “beam” and “column”, “wall” and “floor”. The fact that a line denotes a wall or a number of lines describe a volume, undertakes an investigation in what constitutes a geometrical construct: the line. A three-dimensional space is collapsed in on itself through the definition of volume or plane in an otherwise two-dimensional singular line.Ishigami may be in tune with the present Japanese preoccupation of volumetric play. It may be of no coincidence that Ishigami was once an employee of the La Biennale’s director Kazuyo Sejima for it is SANAA that has promoted the interplay of volumetric boxes. The most pertinent example would be the Moriyama House, Tokyo. Volumes are organized by program with residual external space left to define the volumes entirety. It is an inversion of geometry creating volume.It seems whilst many contemporary architects want to make grand architectural gestures, Ishigami’s project strives for an architecture of disappearance. A subtle mark upon the urban fabric instead of an emblazoned flash of gaudiness. This work is in keeping with Ishigami’s architectural agenda. It is a question of proximity. To be within the confines of an architectural space a user can become oblivious to the envelope; but here, in its intricacy and its delicacy the user is forced to become acutely aware of their own proximity to the structure. It becomes a perilous position, never sure if your transition from one space to another. It defies weight, scale, boundary opacity and in effect becomes infinitely transparent.In the execution of the project, Ishigami conjures a moment of suspension that is a stark impression of the current profession through its lack of definition, clarity and opacity. So saturated and thin, the structure breaks from the traditional spatial boundaries and organizational logic. It is a three-dimensionality, contorted and collapsed into a two-dimensionality. The existing building is no longer the definitive structure as an installation, it is the ‘medium’. The fact that Ishigami has placed a fictitious buidling in the factual (the exhibition space) creates a definable ambiguity. An uncertainty, a confusion. We are all made accutely aware of our proximity to architectural ruin in every sense. Yet Ishigami insists that his existential architectures-as-air are no more than the iterations of a certain idea in a specific contexts. The number of columns is significant only in that it successfully fills the space; the position of threads dictated by efficiency and load alone. Rather than claiming any grand critique of contemporary architecture or prescriptive manner of thinking about space, he marvels as much in potential technical challenges as in the philosophical and almost spiritual suggestions of his design. Across town, another public installation—Peter Zumthor’s hortus conclusus —is a correspondent study in black. Both monochrome, unassuming spaces suggest that in London this summer, architectural thinking is indulging in a pensive moment of reflection. 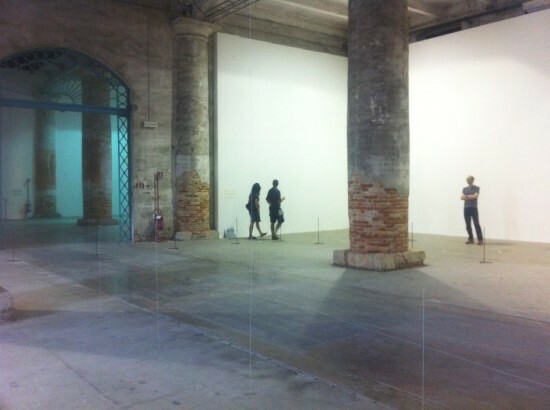 Curator Catherine Ince has long admired Ishigami’s work, having encountered it at close range at the tenth Venice Biennale of Architecture, in 2008. There his ghostly greenhouses, festooned with living curtains of vines, clung like parasites to the Japanese pavilion and demonstrated in more literal terms the architect’s interest in bringing together the structural languages of architecture and nature. It is telling that Ince’s decision to install Ishigami’s piece marks the first instance of an architect fulfilling the Curve Art commissions. 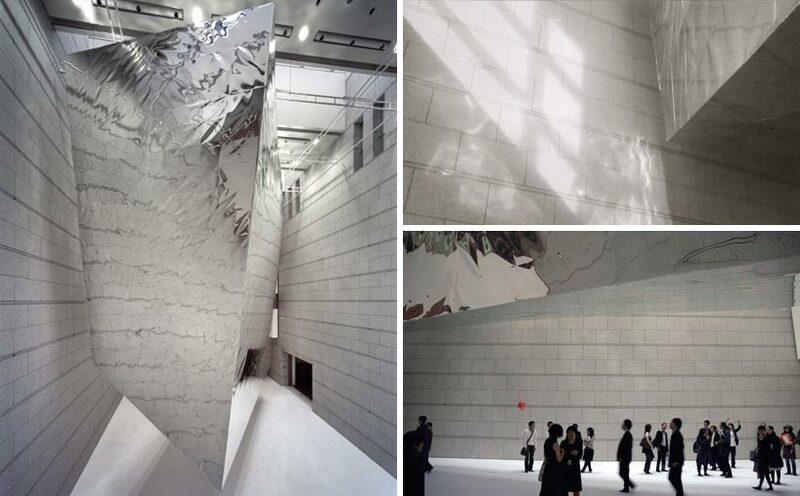 Ishigami is a practicing architect, concerned with structure and space; however, rather than the formal or even ecological implications of organic geometry, Ishigami meditates on the poetics of natural and physical structures. By dealing with space at an atomic level—between particles of matter, at the scale of cloud particles and rain droplets—Ishigami’s investigations are more profound than they are pragmatic; it feels appropriate, then, that his structure is described as being “conceived”, rather than built. And in fact, the structure collapsed just hours after the press preview opened and these images were taken, leaving the project poised somewhere between existing and not existing: not so much a finished presentation as a quest for something nearly impossible. The structural drawing on the walls, which are reminiscent of a Sol LeWitt wall drawing, also contribute to the notion that this project is, at this point, a set of instructions that are lovely to consider but impossible to follow. However, the idea Ishigami is proposing feels so seductive and so new that one can only hope he will prove that notion wrong as he continues to work on the building. Spaced slightly further apart than a large pace, the sinuous columns act like the thrum of a second hand or a heartbeat, articulating the space as you walk through it. 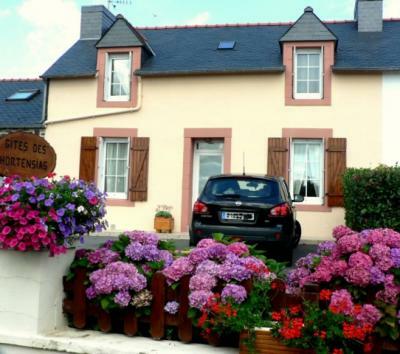 Though visually modest, it is undeniably a very serene experience. The calm rhythm is disturbed only by a periodic urge to stare inelegantly upwards, first balking at the absence of visible support, now spotting a fragile nylon hair against the Barbican’s bush-hammered concrete and cable shafts. It would be an understatement to say that Junya Ishigami ‘s Architecture as Air: Château La Coste borders on the fringes of architecture. Next to the fleshy, fibrous and decidedly solid volumes of London’s Barbican Centre , it seems to be as ephemeral a relation to architectural form as can be imagined. 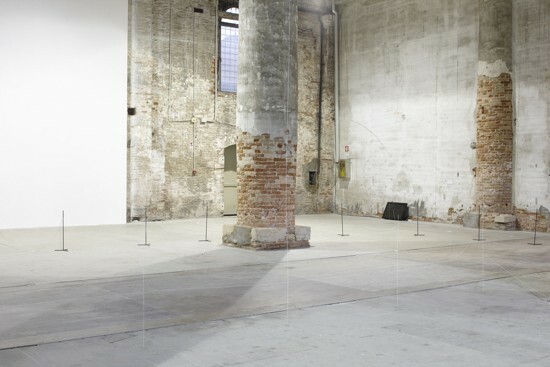 These caveats are familiar; this particular line of enquiry was memorably exhibited at the 2010 Venice Biennale of Architecture, where Ishigami’s site-specific installation won the coveted Golden Lion in spite of another smaller cat. 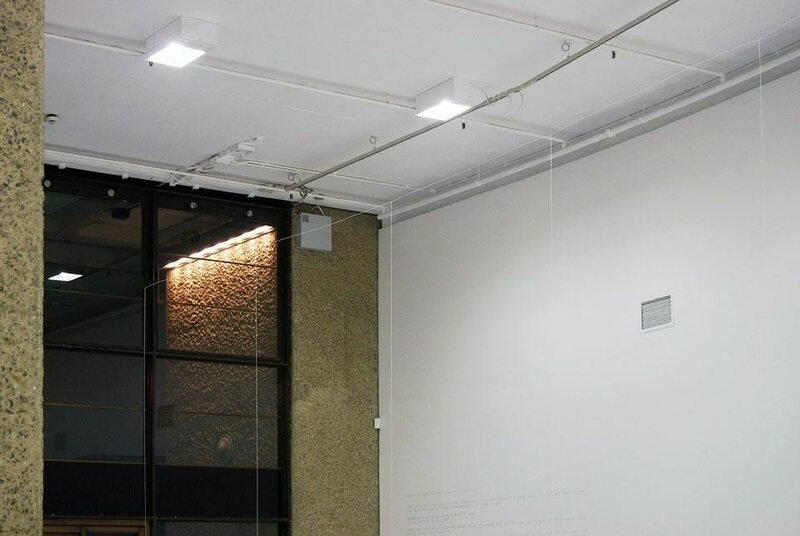 Ishigami’s latest installation picks out the contour of the Curve gallery with a line of ‘raindrop’ columns; barely perceptible white filaments float against the white walled space, tracing an 80 metre arc around the Barbican. The columns are incredible objects themselves; each a hand-rolled tube of white carbon fibre sheet measuring 0.9mm in diameter, the approximate width of a drop of rain. They rise—rather than fall—to around four metres and hover quietly in mid-air, apparently supported by nothing but will. In fact the columns are almost invisibly held by ‘cloud’ threads or transparent nylon fibres—2756 fibres to be precise, 52 cloud-threads to each of the 53 raindrop-column. 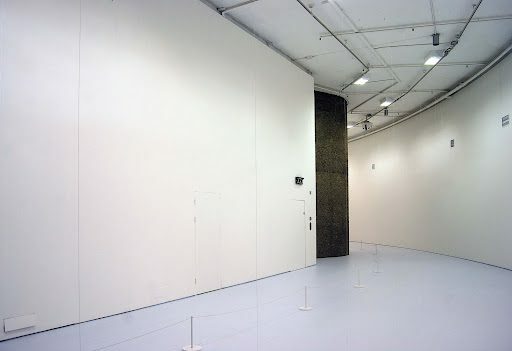 Between these, air—as architecture—and space, its very essence; an intangible wall constructed by the suggestion of a line. Intended as a full-scale study for a building described in the wall text as ‘somewhere in Europe’, the installation proposes a radical rethinking of the possibility of architectural transparency, leaving behind the modernist trope of glass walls in search of a building so light and delicate that it almost doesn’t exist. Winner of the Golden Lion for the best project of the exhibition, Japanese architect Junya Ishigami’s installation was barely visible: it comprised a box made of the thinnest possible white structure and a drawing of that structure on the wall. In awarding Junya Ishigami + Associates the Golden Lion for Best Project at the 12th International Architecture Biennale, in Venice, Italy, for Architecture as Air: Study for Château la Coste , the panel may have announced something more than a simple accolade. Ishigami’s project – measuring 45ft deep, 13ft wide and 13ft high – is intended as a study for a building to be viewed as a model or an actual construction. Its ultra-fine fibrous components stretched taut from the existing architectural elements of the exhibition space make it almost impossible to see at first glance. The user is left not knowing exactly where the project begins or ends. The spatial organization of the project is not easily decipherable with the columns, beams and bracing scaled so small that it becomes entirely imperceptible. The fragility of the structure with its brittle frame barely visible, barely holding weight, barely defining a space could constitute a reflection on architecture. The invisible hand of the architect regulates the user. 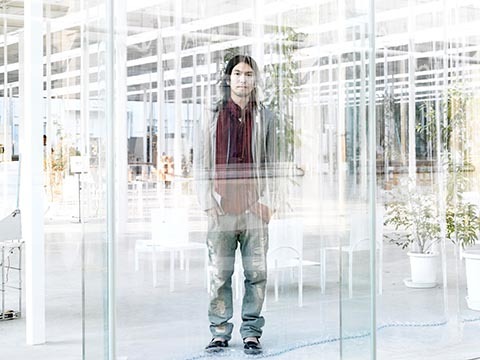 Ishigami has crafted a space of diminishing actuality.